A recomposed landscape, such is the title chosen by the magazine “Architecture Bois” to present in its special number 28 the last realization of Rusticasa in Gagny, in the 93 department. The architect Jérôme Jacqmin makes us the honors of the visit and explains, through seven richly illustrated pages, the peculiarities of this project, which he took special care to integrate into the surrounding landscape. 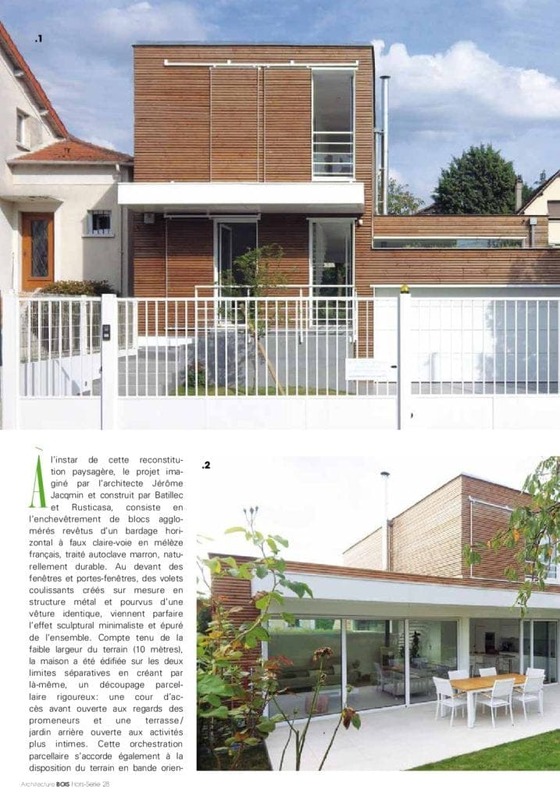 «The tangling of clippboard blocks lined with horizontal lining of French larch wood… comes to complete the sculptural and minimalist effect of the whole», we can read, but the main originality of this project is undoubtedly in the intelligent solutions that were adopted to insert the House in a particularly narrow terrain, only 10 meters wide. The EC-Bois website reproduces an overview of this building you will find here, but you can also read the original article in this link: Architecture-Bois – Un paysage recomposé, or by clicking on the following images.